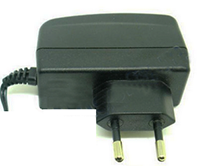 European CEE 7/16 configuration: Europlug 2 PINThe prongs of the Europlug are 19 mm long. They consist of a 9 mm long conductive tip of 4 mm diameter with a rounded ending, followed by a 10 mm long flexible insulated shaft of not more than 3.8 mm diameter. The two prongs are not exactly parallel and converge slightly; their centres are 19 mm apart at the tip and 18.6 mm apart at the base. The elasticity of the converging prongs provides sufficient contact force for the Europlug's current rating with a variety of socket-hole arrangements. The entire plug is 35.3 mm wide and 13.7 mm high, and must not exceed these dimensions within 18 mm behind its front plane (this allows for the recesses on many European socket types). The left and right side of the plug are formed by surfaces that are at 45° relative to the horizontal plan.